Topaz is the gem for those with a November birthday. Chemically topaz is aluminum silicate fluoride hydroxide. The colors come from contaminates or from defects in the crystal structure. Chromium is the contaminate that caused topaz to be pink, red or violet colors. The colors brown, yellow, green or blue are caused by imperfections at the atomic level. Brown is the most common color of topaz. When clear topaz is heated it creates lovely shades of blue. Imperial topaz is a medium reddish orange to orange-red and is one of the gem’s most expensive colors. 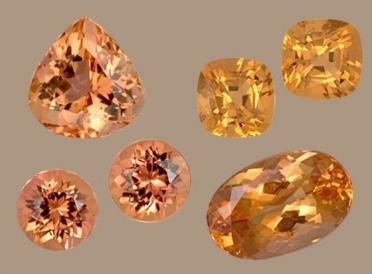 Precious topaz colors are orange, yellowish brown or brownish yellow. Topaz is rated 8 on the Mohs Scale of Hardness and would be suitable for any type of jewelry. Due to its elongated crystal structure most of the gems are cut into ovals, pear shapes and emerald cuts. The word topaz comes from the Sanskrit word meaning fire. In ancient lore topaz could control heat, cool boiling water, relieve fever and calm someone who is angry. Topaz was also thought to increase ones mental capacity and prevent mental disorders. Powdered topaz added to wine could prevent asthma and insomnia and a cure for weak vision was to rub the eyes with wine that had a topaz immersed in it for three days and three nights. Brazil is the major supplier of all topaz. Other deposits are in Russia, Pakistan, Sri Lanka and in Colorado and California.